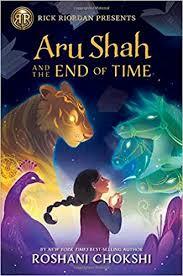 Welcome to the Raff Street Cafe Novel Spotlight where we review Aru Shah and the End of Time by Roshani Chokshi! In addition to the review, we’ll share ways the novel could be implemented into the classroom, along with a Newsela Text Set to pair with it. “Best-selling author Rick Riordan introduces this adventure by Roshani Chokshi about twelve-year-old Aru Shah, who has a tendency to stretch the truth in order to fit in at school. While her classmates are jetting off to family vacations in exotic locales, she’ll be spending her autumn break at home, in the Museum of Ancient Indian Art and Culture, waiting for her mom to return from her latest archeological trip. Is it any wonder that Aru makes up stories about being royalty, traveling to Paris, and having a chauffeur? Just like the review, this novel, from Rick Riordan Presents, is packed with action. Fans of Percy Jackson will love this new character and mythology. The first thought that came to mind when reading the book was, “I have definitely had an Aru and a Mini in class before!” Chokshi does a great job of creating realistic characters that cause the reader to experience a wide range of emotions with as they move through the book. There were several times while reading when Aru, being a typical 12-year-old, drove me nuts! The novel is aimed at ages 9 and up and clocks in at 368 pages. Personally, I would say the book’s target group would be students in junior high because of how relatable the characters are to that age level. Aru is definitely trying to find her place in junior high and the story helps readers realize that not all perceived weaknesses are in fact weaknesses. I also think the book would be great for a World History or ELA course. As a history teacher, it’s awesome to have a good novel that focuses on non-Western Mythology. It would be an excellent pairing for an Ancient India unit in any World History course. In an ELA class, this story would be great for a characterization unit where students could track how the characters grow and develop throughout the story. The characters really are a strength of the novel. They aren’t the typical heroes that you find in books for this age-level. They are full of self-doubt, second-guessing, and typically lacking support from most of the people surrounding them. Another great piece of the novel is Chokshi’s theme throughout the book about family. The girls in the book are not blood relatives but, through their bond, become sisters. Chokshi really makes readers think about the power of family and how family impacts who we are and who we become in life. Both characters come from very different family backgrounds, much like society today. The characters also experience the difficulties with being away from family and how difficult that can be on children. Other relatable concepts and themes the book examines include the power of lies, creativity, and the impact of peers. The novel is full of opportunities to have authentic conversations built around SEL. Self-identity and finding out who we are as people is a central theme that is developed through the book with Aru and Mini. My only concern with the book in a junior high classroom would be the pacing. The novel is 368 pages and would take quite a bit of time and dedication to get through in a timely manner. However, despite the length, this novel is an opportunity to expose students to a culture and mythology that is sadly not covered as much as it should be in a typical history course. I would highly recommend this novel to anyone looking for an adventure of self-discovery and who wants real, relatable characters. Below is a Newsela Text Set that we created to pair informational texts with content and themes from the novel. If you’ve used this novel with your students, we’d love to hear about it! Be sure to drop a comment below. ← Newsela 101: Graffiti Walls!